This is a wonderfully tasty chicken stir fry recipe that is really healthy and very low in saturated fat. This is one of those quick easy chicken recipes that can be thrown together relatively quickly. The most time consuming part is chopping the veggies, but even that can be done pretty fast. You could even recruit your children to help you chop – I know my girls love to help me slice and dice, which is great because it is so good to spend that quality time together. 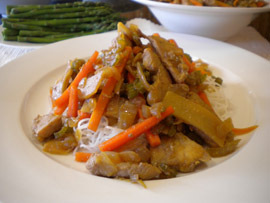 Stir fry recipes are really a blank canvas and you could use any combination of vegetables and meat you prefer, but sometimes it’s great to have a tasty and easy to prepare chicken stir fry recipe to follow. When creating this recipe, I really just used what veggies I had available at that time, but you could add mushrooms, red or yellow pepper or anything you like really…it will all taste good. 1. In a bowl, mix together the soy sauce, mirin and grated ginger, then add the chicken strips. If you have time, let it marinade for a few hours in the fridge, but if you don’t have the time, don’t worry – use it just like that. 2. Heat the oil in a pan and then add the onions, chicken and marinade sauce and stir fry for a few minutes before adding the carrots and celery. 3. Add the fish sauce and oyster sauce and stir fry for a minute or so, then add the bamboo shoots and continue cooking till they are heated through. 4. Serve with rice noodles, brown basmati rice or whole wheat spaghetti. Mirin is a sweet Japanese rice wine used for cooking. You can find it at your local Asian food store, but just leave it out if you can’t find any – the stir fry will still taste good without it. Fish sauce and oyster sauce can also be found at an Asian food store, but again if you don’t have it or can’t find it you can really leave it out. If you have some simple chicken recipes or stir fry recipe that you would like to share on this website, please click on this care to share? link to submit your recipe. I am always so glad to receive new and delicious healthy recipes. Please note that all your details will remain completely confidential – I won’t give them out to anybody and will contact you personally to receive your permission to use your recipe on this website.